This image from the Hubble Space Telescope shows Sh 2-106, or S106 for short. This is a compact star forming region in the constellation Cygnus (The Swan). The image was released on Dec. 15, 2011. Just in time for the holidays, the Hubble Space Telescope has snapped a spectacular view of a star-forming region in our Milky Way galaxy that looks like a snow angel in deep space. This region, called Sharples 2-106 (or S106 for short) is located nearly 2,000 light-years away in the direction of the constellation of Cygnus (The Swan). The nebula is found in a relatively isolated part of the Milky Way, researchers said. The S106 nebula measures several light-years across, and contains vast clouds of gas that resemble outstretched wings amidst an hourglass shape. The light from the glowing gas is colored blue in this image. 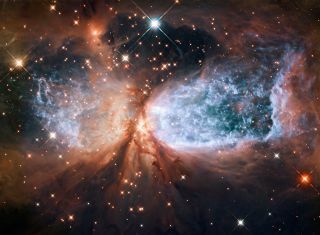 A video and photo of the "snow angel" based on Hubble's observations reveals a spectacular view of the cosmic sight. Hubble's view captures furious activity in the nebula, with ridges and ripples of super-hot gas mixing with the cooler interstellar medium. A massive young star, called Infrared Source 4 or IRS 4, is responsible for this turbulence, scientists said. Radiation from IRS 4 makes the lobes of gas glow bright blue in the image, as they stretch outward from the central star. Luminous red veins also appear throughout the nebula creating intricate patterns. A ring of dust and gas around the star squeezes the expanding nebula into its apparent hourglass shape. Faint light from the central star reflects off tiny dust particles, making the surrounding environment glow, and revealing darker filaments of dust beneath the blue dust clouds, the researchers said. Astronomers have studied S106 and found several hundred brown dwarfs, which are cool, failed stars. When the nebula is viewed in infrared wavelengths, more than 600 of these misfit stars appear, scientists said. Brown dwarfs weigh less than a tenth of our sun, and because of this low mass, they are unable to trigger enough energy through nuclear fusion. These cosmic objects encompass the S106 nebula in a small cluster, the researchers said. S106 was the 106th object to be catalogued by astronomer Stewart Sharpless in the 1950s, the researchers said. The newly released image was taken by Hubble in February. The composite picture was created by stitching together two images taken in infrared light.